Some 18cm long (including their long tail streamers) and with a typical wingspan of 34cm, Barn Swallows (often simply called Swallows) have red throats and a blue sheen on the back and wings - a feature that clearly distinguishes Swallows from their close relatives the various martins. The Barn Swallow breeds throughout most of the northern hemisphere, and worldwide their numbers are estimated to be between 300 million and 500 million. This is a late-spring visitor to Britain, and its return from its winter feeding grounds in southern Africa is eagerly awaited each season. (One swallow may not make a summer, but the first one I see each year certainly makes my day.) 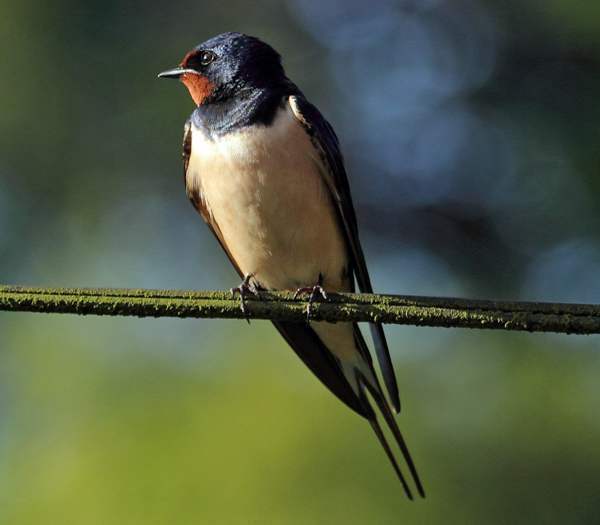 Swallows can be seen throughout Britain and Ireland; they are usually with us here in Britain from April through to October. Barn Swallows - generally referred to simply as Swallows - feed on insects. They love open spaces, but you will also see them swooping low over rivers and ponds when there are plenty of aquatic insects either emerging (loosely referred to as 'hatching'), performing their mating dances, or laying eggs on the surface of the water. Being swift and agile in flight, Barn Swallows are not easy targets for birds of prey; however, their nest do get plundered by such mammals as rats, squirrels and, sadly, domestic cats. A Swallow's nest is cup shaped and made of grass, mud and feathers. Any ledge will do at a push, but in Britain they can sometimes be seen nesting in old harbour walls or under bridges but probably often on beams in barns, disused factories or other old buildings visited infrequently by people. The long, pointed eggs are white with brown spots, and four to six is a normal clutch. 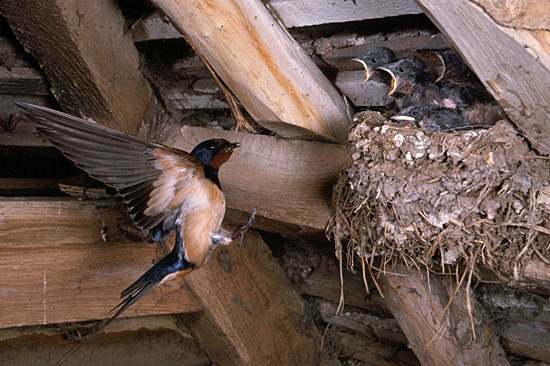 The young Swallows hatch between May and August. This page includes pictures kindly contributed by Will Brown and Melvin Grey.